BPL Player Draft 2018. Bangladesh Premier League Auction Live On Channel 9 Television in Bangladesh. BPL T20 Auction 2018 will be Held on 25th October, 2018. BPL T20 Player By Choice Live Broadcast Tv Channel List World Wide. High demanding players in BPL are Riyad and Sabbir. The 6th BPL is going to start on 5th January, 2019. On 25th October, 2018 , there will be players draft for this tournament. There is a lot of excitement for this player draft. 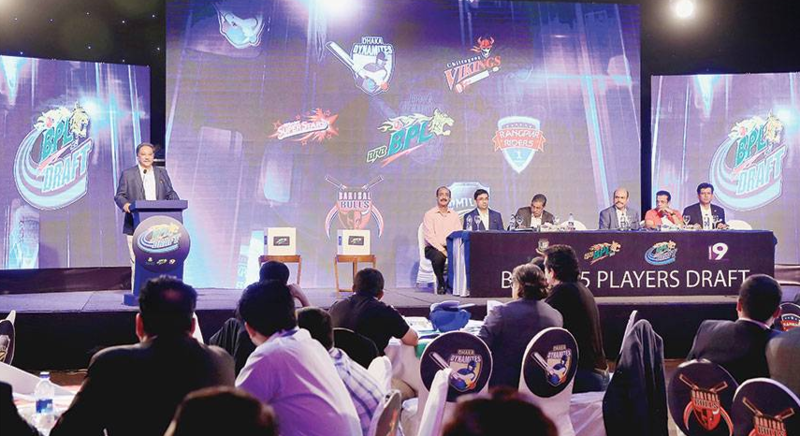 Bangladesh Premier League Player Draft Held on 25 October, 2018. Shakib Al Hasan, Tamim Iqbal, Musfiqur Rahim and Masrafe Bin Mortaza will be in the center of high demand from the franchises. Besides them, there are some players who did well in international T-20 and also showed excellent performance in last BPL or in recently DPL . may also have high demand. Player draft for Bangladesh Premier League 2018 on October. Mahmud Ullah : He was the last ICON players who were taken at last year. He, this experienced player from national team scored a fourth position regarding run in last BPL. He scored 278 runs from 13 matches. He also forwarded Barisal Bulls with his captain ship. Besides, in recent T-20, he did a stunning performance. Bangladesh played in final in Asia Cup depended on his bat. He is a spinner . If he is on the team, there is no tension for captain ship. So, every team is very eager to have him on the team. The most promising batsman from the national team is Sabbir Rahman. He has all qualifications for T-20 . He scored 79 runs in 49 balls last year in BPL on behalf of Rangpur Raiders and forwarded the team to the final. He is also efficient in fielding as like in batting. In the case of need, he can do bowling also. He scored the highest run in T-20 on behalf of Bangladesh. So far he played 26 T-20 on behalf of Bangladesh. Among them in 25 innings, on average he scored 30 runs and altogether 604 runs with a strike rate of 120. So, his demand is sky high. One of the most experienced players in the domestic cricket is Mosharraf Hossain Rubel . On behalf of Dhaka Dynamites , Rubel, the spinner has taken 16 wickets in 10 matches last year. In need, he can be sparking with batting as well as bowling. Recently, he has got a chance to 20 members preliminary squad team who are going to play the series against Afghanistan and England. He can play an important role for T-20n short version. So, this year many teams have the expectation to have Rubel. Last year Abu Haider Rony caught everyone’s eye due to him pace bowling. On behalf of Comilla Victorians , he captured 21 wickets in 12 matches. He captured 1 wicket less than the highest Wicket-taker, Kevin Cupper. But among Bangladeshi players, he was the highest Wicket-taker . So, it is easy to guess that last year promising player, Abu Haider Rony will get high attention from the franchises. BPL Player Draft 2018. Pacer Mustafizur Rahman is not playing in coming BPL due to his injury. So, Al-Amin may be the most wanted pace bowler in BPL. Right handed this pacer played on behalf of Barisal Bulls last year. He won 17 wickets in 13 matches scored 7.93 economy. He did hectic against Shylet Superstars . 26 years old, this player is waiting with full enthusiasm this year also . He ranked 15th in ICC ranking. So for a pacer, every team will impatience to have him. In BPL there will be 7 teams. Rajshahi and Khulna , who did not participate last year are going to partake this year. On the other hand, there is no team for Shylet this year. Bangladesh Premier League (BPL) Player Draft & Players By Choice 2018. Get BPL Player Draft 2018 With BPL 2018 Full Team and Player List.